Ever since I can remember, I have always been surrounded by men. Before the age of around 11 most of my friends were boys, from the ones with whom I’d play wrestling and football to the ones I’d persuade to play house with me and my dolls, which to be honest wasn’t that difficult. From my experience with men, I got to see that they actually can be deeply caring and very gentle. Even more so, I have observed that the toughest, rock-solid, scary looking guys have this tender, child-like quality to them too, which no extra-large bicep, dark tattoo or hoody could conceal. Men, just like women, are sensitive. Men, just like women, seek connection and love. Men, just like women, deserve to be treated tenderly and honoured for these innate qualities. Sadly, and no different from women, men build up layers of protection to keep them ‘safe’ from this world full of social ideals and expectations that are not configured to let them live their sweetness, their sensitivity and their delicacy. So often we as women take the men in our lives for granted, focussing on all of the things they do, rather than who they are on the inside. We blame men for treating us poorly and for not appreciating us as women. However, do we ever pause to consider that we might be doing the same to them? So many of us dive into our ignorance and arrogance and choose not to be open in relationships with our partners, not to mention the games we play. Why? Because we can. Because ‘he’s a man,’ or worse, because ‘men don’t talk about feelings,’ or perhaps the worst, because ‘men don’t understand.’ Yet, have we tried? Have we truly given the men we know, and the ones we don’t, an opportunity to open up to us by being transparently open towards them first? Why do we think that women have the right to express their feelings but men do not? We know that repressed feelings can lead to self-abuse in all of its varieties, yet we praise men for doing exactly that – quashing their sensitivity. In our 21st century society men are by and large marginalised, based on the wage they earn, how tall they are, or how defined their six pack is. Men are demonised for the pay gap between the genders, yet still many women are 100% happy to exploit men for their money and avoid paying for dinners, movie tickets, travel, etc. Men are blamed for being indifferent and hostile, which they can be, yet the root cause of these behaviours is not sought. As women, so many of us have become incredibly hard and unbelievably tough in our mission to be the perfect wife, the best mum, the top employee, the greatest friend, ideal neighbour or the sister from heaven. We constantly try to reach our unrealistic pictures of what we, our partners and our children should be like, completely losing touch with our most wonderful ability to be the ones who can best support the quality of tenderness to flourish in men. But this can’t come as a surprise to us when we women are not living that same tenderness we came into this world with! But what if by dismissing and denying men’s tenderness, we are effectively rejecting them for who they truly are? This must create very deep pain, making men even more sensitive to rejection, because when we are shown that who we truly are is not good enough, we get hurt beyond imagination and thus become desensitised, indifferent and in the extreme –hostile. Men really can be beautifully tender, gentle, and caring. They have great depths of feelings, a capacity for understanding, nurturing and the ability to be great listeners. We as women have an amazing opportunity to encourage, support and respect these very qualities in men (and in ourselves) that we crave more than any chocolate bar on earth. Granting men permission to be who they truly are, their amazing selves, will doubtless contribute to a decrease in men’s depression and the current alarming suicide rates, as well as curb the devastating rise in substance abuse among men. And consider for a moment the wonderful effects that this in turn would have on women! Next time an opportunity arises to express your love and appreciation for a man (any man) in your life, be that at dinner at your neighbour’s home, your boss’ birthday or a nephew’s graduation day – or even better, for no special reason at all – say it with half a dozen red/white/yellow or pink roses and watch the glee in the man’s eye thanking you for acknowledging and honouring the tenderness and preciousness he truly is. And should such a gesture make him appear awkward in expressing his appreciation of the gift, let that not be a reason to hold back from doing so again – for men also need to get used to the fact that they are tender and precious. A young lady living in the heart of London, I love getting to the bottom of the abnormalities in our so called normal society. Not one to hold back my love when writing, cooking, singing, talking to friends or meeting strangers on the train. If you ever cross paths with me, give me a smile, maybe even break the ordinary and start a conversation. ‘We blame men for treating us poorly and for not appreciating us as women. However, do we ever pause to consider that we might be doing the same to them?’ And equally doing the same to ourselves, and then expect another to treat us in a more loving way than we can do for self. This is a great question; ‘But what if by dismissing and denying men’s tenderness, we are effectively rejecting them for who they truly are?’ I observe this with how boys are treated, I notice as boys grow up there is often a hardening and toughening up that feels very unnatural, it feel like a shell of protection is being put on to cover the tenderness. Imagine that men are seeking exactly what women are love and connection! We all have a long way to go in appreciating our innate tenderness and beauty. We may have lived with statues of men, hard at heart, fellows tortured by their hurts – but no matter our past we cannot treat men less than women or a child and call it Love. No matter our previous choices we all deserve to be treated cherishing our divinity. The protective outer behaviours can be so off putting – but we need to know that they are only there because of our deep beauty inside. In a world of hardness and manipulative game playing, someone has got to make the first move and see the truth. God has given us our vulnerability, tenderness, sensitive, preciousness so when this does not add-up in our lives we feel the rejection all around us and could this be one of the main reasons why so many men commit suicide? I really did used to see men for all they did not who they were – and as I look back now I can see how I missed out on so much because of that. To now begin to appreciate men for who they are is so refreshing and loving. I love how much I love men, I used to think men are really different from women, a little like strange species, but they are not, and the more I have dropped my issues with them, the more I have enjoyed the company of men, regardless of being a friend, husband, family, stranger. We should be meeting each gender equal and drop our issues, whether man or woman. Suicide is huge in men, these gorgeous sensitive tender men are feeling life is too much to cope with and they look for a way out, causing an absolutely devastating impact on those around them. The way we bring boys up is not honouring of the tender men they are. When a man is truly tender it exposes us ladies to the hardness we have been living in, which is great as without this reflection we can continue being hard with ourselves, hard with our movements and hard with others – We have a choice when we see a man in his vulnerability – we either react or melt- when we melt and accept the reflection we receive a big healing. ‘We constantly try to reach our unrealistic pictures of what we, our partners and our children should be like, completely losing touch with our most wonderful ability to be the ones who can best support the quality of tenderness to flourish in men.’ And in trying to reach these pictures we as women become tough and hard ourselves instead of be the inspiration we can be for men and women alike. Men are hanging out for tenderness, intimacy, true friendship and connection. We’ve just all held back waiting for someone else to make the first move. Seize the chance, open up and they will too. I have been loving the way I am starting to change the way I see men and how it has been a way of letting go of the social expectations of what a man is. Seeing men that are choosing to live The Way of The Livingness and connecting to their tender and delicate qualities within them is just gorgeous to see and be around. This certainly bring us home to the truth of where our responsibility lies whenever we are with a young boy or man. Are we rejecting them by not meeting them for who they are or are we embracing and appreciating all that they naturally are in essence? A powerful message for us both, men and woman, to consider more deeply how we are with each other and how much we truly appreciate each other. Thank you Viktoria. It is much easier for us women to blame men for not opening up than be very raw and vulnerable with them. Until we let down our walls and hardness, how can we know how willing a man is to be vulnerable with us and feel safe enough to be so? Great question Fiona, we are more comfortable with our walls and hardness, with the status quo that exists already for a long long time. People are people and they come in all different shapes, sizes and genders but at the end of the day despite appearances and behaviour we are all love at heart. So, I did it. I bought a man a bunch of flowers, beautifully wrapped from the woman on the market. I knew they were his favourite flowers but still was unsure how they would be received. 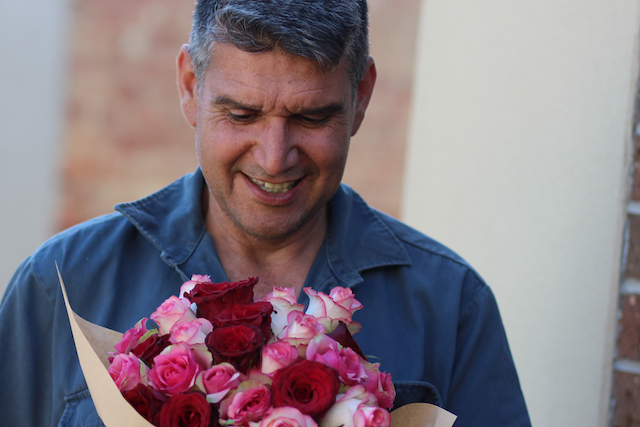 He loved them, there was first a slight surprise and almost disbelief that someone could be buying flowers for him and then a smile played around his lips and a very appreciative thank you followed. He had no vase so cut down a large water bottle and placed them in this on the window sill of his home. I could tell how touched he was and realised that this would not be the last time I gave a man such a sweet gift. If we want the true tender qualities of a man to be expressed then we have to allow him the space to feel safe to do so, in no different way to accepting our own precious and sensitive qualities, the trouble being we have all been conditioned to take on these divisive roles that keep us from being open and vulnerable with each other and yet this is the only way that we can have true and continuously expanding relationships with each other. It is all because of this false images collectively are held in societies of how you should behave like a man and how you should behave like a woman. While as child we may think that it is the normal because everybody is doing this, we all do feel in our growing up that it is a struggle and at time we would like to question this but there are no ears to listen as they mostly are all deafened by the behaviour that we collectively have made the normal. It is simply said a game how men and women behave in a relationship. Because we have fallen for the false ideals how to be as a man and a women and consequently have identified ourselves with, the fighting between the genders emerges but also the inner fight because it is the the image that wants to hold stand but too strongly interferes with how we sense we are from nature. In the last few weeks I have become more aware of how important this awareness of how tender and precious men are is. So much comes from the expectation we place on men to be a certain way and respond in a certain way. Not only does this not give them the space to respond as they feel but there is a preconceived picture I have then placed on them and there is clearly a hurt for not being seen for who they truly are. A true mans life: everyday going deeper with rediscovering your delicacy and letting it out. Everything else is just a distraction from that. It suits us to prolong the picture of the man as war machine. To look under the hood and appreciate the true tenderness that is there means we’d have to accept its in us too. When we as women learn to open up and learn to show our transparency and vulnerability in our relationships with men, we offer to them an opening and an equaliness for them to in turn show just how tender and sensitive they can actually be, and that it is safe for them to be also. I love what you have shared here Viktoria, you have laid down the gauntlet and asked us to be the change we want to see in the world and in our lives. The suicide rates are all our business and it is time we were on the front foot addressing them. It doesn’t take money, it takes a commitment to see men for who they are and give them space and grace to express without the layering of ideals and beliefs heaped on their shoulders. The commitment to seeing men for who they truly are is the game changer. Not a mission but a willingness to love more of the qualities that we know are true and reside in all. I agree, it does require a willingness to receive someone for who they are, not the pictures and ideas of what we think they should be. How often do we do this, meet someone else for who they are beyond our ideas or their ideas, the front we put out…worth looking at. “Sadly, and no different from women, men build up layers of protection to keep them ‘safe’ from this world full of social ideals and expectations that are not configured to let them live their sweetness, their sensitivity and their delicacy.” Heavens we are all trying to keep ourselves safe from each other – how insane is that?! It is so true Lucy, it sometime seems like we are walking around with a plate of armour around our hearts front and back so there is very little openness to let others in and feel we are all the same in essence.